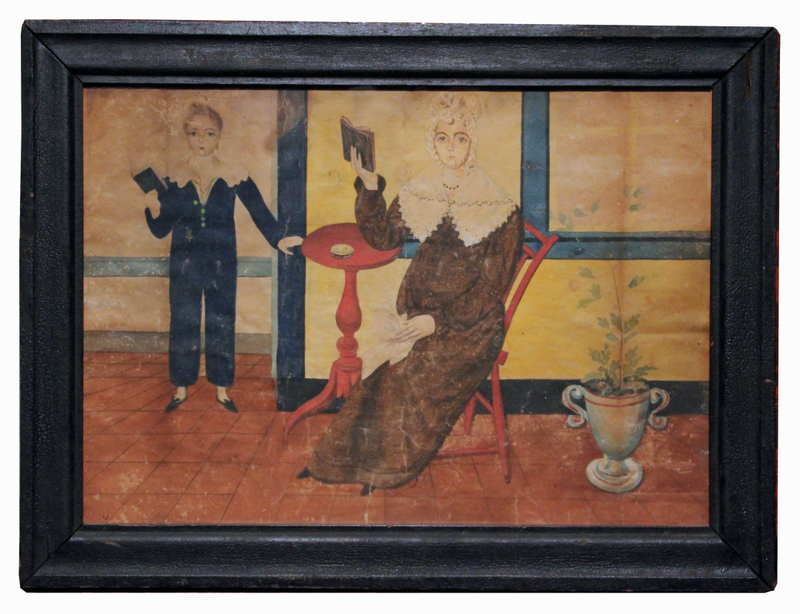 Antique Dealers Association of America - Historically Significant “American Fancy” Interior Folk Art Painting of Mother and Son. 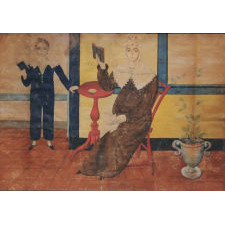 Historically Significant “American Fancy” Interior Folk Art Painting of Mother and Son. New England, ca. 1820-1835. Watercolor on wove paper. A rare glimpse into a New England country home showing seldom-seen American Fancy-Period interior features, including blue(!) moldings, yellow walls, and painted furniture in which the prevailing style valued imagination and creativity and COLOR. 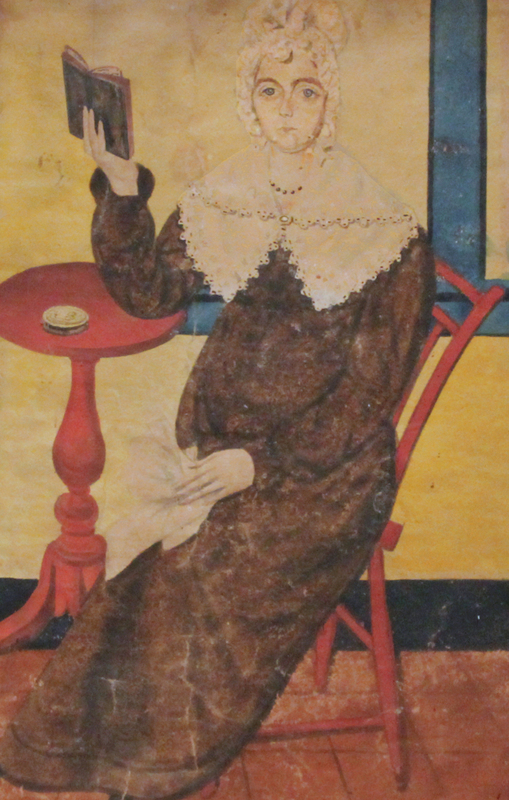 The young mother in full-length dress with lace-collar and bonnet seated on a red-painted bird-cage Windsor chair, her arm resting on a beautifully turned and similarly painted candle stand. Her son dressed in a blue “skeleton suit”, an outfit for small boys, popular from about 1790 to the late 1820s. 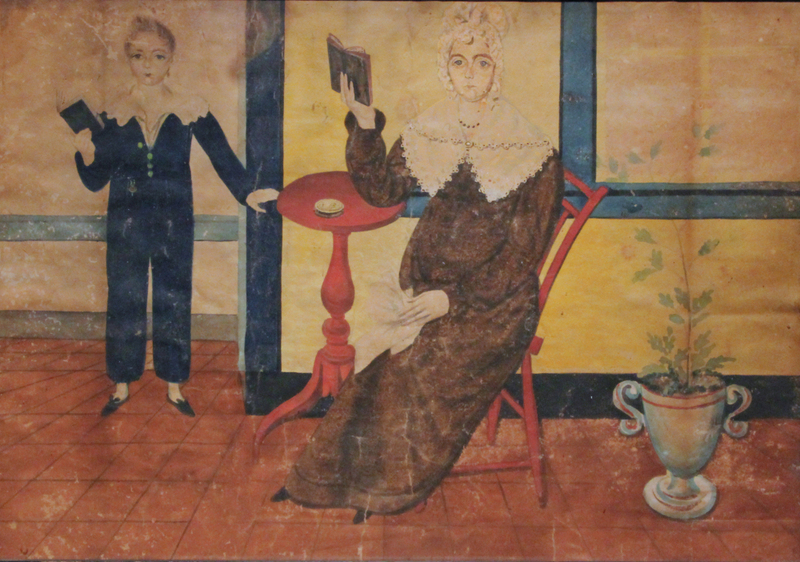 Both the mother and boy conspicuously raise books, either symbolizing pride in their literacy, or perhaps they are having lessons. 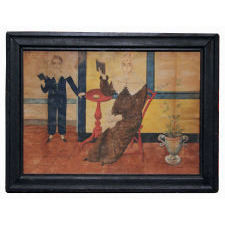 The frame of about 16 ¼ inches x 12 1/4 in dry black paint is period and likely original. Untouched with toning and creases. For reference, see American Fancy: Exuberance in the Arts, 1790-1840, Sumpter Priddy. 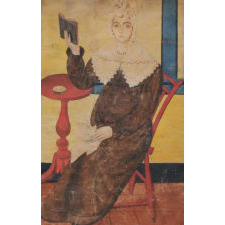 Unknown artist, possibly by the same hand as that of the watercolor portrait on page 76 of “American Folk Painting” by Mary Black and Jean Lipman. Provenance: Long time private collection. A treasure rediscovered.